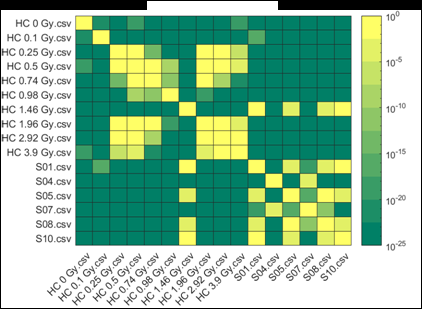 Figure 2 (from the article): Representative heat maps of chromosome object count distributions for Health Canada calibration (HC ##Gy.csv) and exercise (S##.csv) samples. 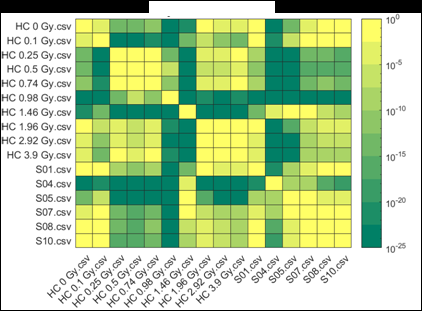 Show: legend indicates significance of pairwise comparisons of object counts in (bottom panel) unselected vs. (top panel) Model B_C filter (5) selected images from each sample. Values close to 10^0 are not significant, whereas values such as 10^-20 are significant differences between samples. The legend displays probability thresholds of Wilcoxon signed rank tests of chromosome object counts between each pair of samples from the HC laboratory. Similar results were obtained for other chromosomal features. Written by: Peter Rogan on November 28, 2018.